If your eyes feel tired, sore or gritty, you may have 'dry eyes'. Dry eyes occur when there are not enough tears to keep your eyes lubricated. Normally eyes are covered with a thin invisible film of tears. Tears are the lubricating 'oil' of the eye surface. If there are not enough tears, or if the tears do not spread properly across the eyes, the eyes become dry and sore. They may feel scratchy or gritty as though there is something in them. They may also be a little itchy and they may be red. 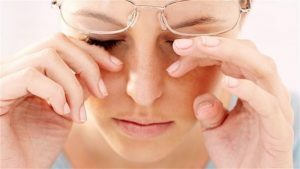 Poorly spreading the tears may also be caused by an inflammation of the eyelids (Blepharitis). Sometimes your eyes may water; there may be enough tears, but the tears do not spread properly. The poor spreading makes the eyes sore and this makes them water. Having a dry eye does not damage your eye. Your sight may be slightly blurred, but will not be permanently affected. To make your eyes comfortable you need to replenish the natural tear film that protects the surface of your eyes. Four types of products are available, and all are harmless; they do not contain any drugs, merely 'oiling' the surface of the eye. Tear drop preparations (with preservatives) - These are simple salt solutions with added ingredients which help them spread across the eye. They make the eye more comfortable by lubricating the surface, but the effect does not last all that long. They contain preservatives. Tear drop preparations (without preservatives) - These are particularly useful for people with very dry eyes. Because they have no preservative they can be used more often, even every half hour, without damaging the eyes. Eye gel preparations - These are relatively new products, and are the most useful. They last longer than drops, do not cause misty vision and can be used at bedtime as they last partly through the night. Eye ointments - These products are much thicker and greasier than eye drops. They stay in the eye much longer; try using them last thing at night. During the day they may cause misty vision.